Student-guitarists can learn a great deal from Annette Kruisbrink (°1958), a well-known Dutch guitarist and original composer, performing regulary in solo recitals, but also in duo with Arlette Ruelens (The Anido Guitar Duo) or with soprano Franka Van Essen (Duo Kruisbrink & Van Essen) and in the Trio Trobairitz. 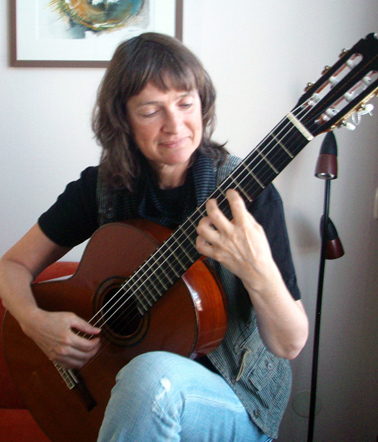 A pupil of Pieter van der Staak, Leo Brouwer, John Duarte & Toyohiko Satoh, she has been a professor of contemporary music and ethno music, and teaches now at the Anido Guitar School, which she created (named in honor of Argentinian classical guitarist and compser Maria Luisa Anido). She is frequently invited to be a panel member for international guitar and composition competitions. But Annette Kruisbrink is also and foremost a prolific and acclaimed composer with over 300 compositions behind her name, for which she has won several international prizes and awards. Compositions for guitar of course in several combinations with other instruments or voice, but also of string quartets, four hand piano, marimba or larger mixed ensembles. She developed her own guitar study method. To give you an idea of her innovative and joyful style, look and listen to some performances of her work, for which you can also find the sheet music in the Partitor library. I’m particulary fond of the ‘Duo Misto’ for cello and guitar, an intimate and romantic, yet modern, piece of music. Annette is particulary interested in including the voice in her compositions, be it in songs or as narrative element, going as far as full-blown musical storytelling. “The Japanese stonecutter” is a musical interpretation of a text by Multatuli. Discover more of Annette Kruisbrink in the Partitor library. Guitar students, let’s go to the beach !